In a sense, not much changed in the Israeli elections of 2015, despite media reports of a “landslide” victory for incumbent Prime Minister Binyamin Netanyahu. The country is still almost equally divided between Left and Right. The parties of the Zionist Left (Labour and Meretz) have seen their combined vote steadily increase over the last three elections, from just 16 Knesset seats (out of 120) to 21, and now to 29. The voting strength of the Arab parties is larger than ever, with a single united bloc now holding 13 seats, a record result. The main parties of the Right (Likud, Jewish Home and Avigdor Lieberman’s Yisrael Beitenu) grew by just a single seat, from 43 to 44. The difference though is that while previously Likud held just 18 of those seats, it now holds 30 – and the other two Right parties dropped by 11 seats. The two ultra-Orthodox parties lost a considerable amount of support, dropping from 18 to 13 seats. It almost sounds like I’m describing a win for the Left, but of course it will not be the Left forming the government – it will once again be Netanyahu. The reason for this is that a coalition of the Right parties, the ultra-orthodox and one of the centre parties (the new party Kulanu, headed by former Likud minister Moshe Kahlon, which won 10 Knesset seats), allows for a majority government headed by Netanyahu. So while the Left grew, it did not grow by enough, and things will stay pretty much the same. Except for one thing – Israeli politics changed, and changed for the worse, in this campaign. The change can only be described as the “Putinisation” of Israel. In the course of an election campaign which saw Netanyahu struggling to survive, and only days before the election facing near-certain defeat, the Israeli Prime Minister used a number of tactics which seemed to have been inspired by the Russian President. He made an election issue of the role of “foreign money” in Israeli politics and was particularly concerned with “foreign-funded” non-governmental organisations (NGOs). This is not new; the Israeli Right has long been concerned about groups which promote, among other things, human rights for Palestinians. But Netanyahu embraced it, focussing in particular on V15, a non-partisan NGO that campaigned for his defeat. In a post-election interview with MSNBC, Netanyahu continued to allege that “tens of millions” of dollars were spent by shadowy foreign sources to topple him. This of course has been central to Putin’s rule, and the Russian President has long alleged that any and all democratic revolutions that take place in Russia’s “near abroad” such as Georgia and Ukraine are almost by definition foreign-funded plots. This is not unique to Putin; other dictators such as Sisi in Egypt have similarly cracked down on NGOs that receive foreign money. What is unusual is for this to be a central issue in Israeli politics. Putin came to power at a time when Russia was experiencing a flowering of freedom of expression, with a number of independent newspapers and television stations, many of which have since been shut down. Media loyal to the regime dominates and dissident voices are heard only with difficulty. Israel, on the other hand, has long been seen as an oasis of press freedom in the desert of a region dominated by dictatorships of various kinds. Newspapers like Ha’aretz have long played the role of critics of Israeli governments and critical voices could be heard on television and other media as well. But taking another page from Putin’s book, Netanyahu has tried to clamp down on the Channel 10 television station which was seen as hostile to his rule, and with the financial backing of an American gambling tycoon, funded his own free daily newspaper to rival the established ones which were seen as too critical of his policies. Chief among these is the daily newspaper Yediot Ahronot, which faces both a commercial and political challenge from the free paper. Following the election, Netanyahu’s supporters were quick to take to the airwaves to protest how the mainstream media covered the Prime Minister with none-too-subtle hints that something needed to be done to reign in excessive criticism of the country’s leader. Like Putin, Netanyahu’s strong point is that he’s seen as “Mr Security” – someone who will stop at nothing to defend the country. Both Putin and Netanyahu have made much of the Islamist threat, and both have expressed concern that the West doesn’t understand that threat as well as they do. In the case of Putin, it’s the Chechens and their allies in the North Caucasus. In Netanyahu’s case, it’s Iran, Islamic State, Hamas and Hizbollah. Netanyahu campaigned on the issue of the Islamist threat to the exclusion of everything else. Social and economic issues played little role in his campaign. Like Putin, who’s proud of his KGB past, Netanyahu still trades on his youthful exploits as a member of an elite unit in the Israeli army. Most shamefully, in the final hours of the campaign, Netanyahu launched a racist tirade against “busloads of Arabs” who dared to vote. He called upon his supporters to rush to the polls, otherwise the Left might come to power. Putin too has encouraged anti-Muslim racism and xenophobia in general as a way of keeping Russians united around his rule. As Putin grew stronger and more popular, he refused to debate his opponents and preferred to delegitimise them, and in some cases jail them or kill them. Netanyahu refused to debate his main rival, Yitzhak Herzog of the Labour Party, and uses every opportunity to delegitimise the opposition. The parallels between the two leaders are striking, Right down to some details. Putin, for example, has found an admirer in washed-up “actor” Steven Seagal, star of such forgettable films as “Under Siege”. Putin and Seagal apparently share a love of martial arts. Netanyahu’s B-movie actor is Chuck Norris, star of “Walker, Texas Ranger” whose video message supporting the Likud leader was promoted to the world through the Prime Minister’s official Twitter feed. 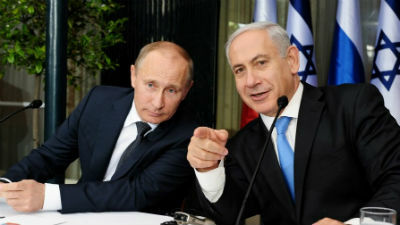 Blaming foreign-funded NGOs for stirring things up, accusing his opponents of disloyalty, threatening independent media, and so on are all tactics Netanyahu has adopted from Putin. This is not good news for Israel. While at the moment the country remains a democracy (except in the occupied territories), with a lively free press, that could begin to change. Netanyahu would still like to close down Channel 10, to intimidate newspapers like Ha’aretz and Yediot Ahronot into silence, and to cut off foreign money that might be funding NGOs he doesn’t like. Faced with those possibilities, the Israeli Left needs to be thinking how to cope with an increasingly authoritarian leader who’s learning from Putin’s book. Normally one would turn to see what the Russian democrats and dissidents have been doing, but there’s no success story to report. It’s up to the Israeli Left and their supporters abroad to develop a strategy to block any attempts by Netanyahu to undermine Israel’s democracy. Netanyahu’s victory is widely being interpreted as a gift to those supporting a boycott of Israel, and the growth of the BDS campaign which will almost certainly result from this will not make the work of the Israeli opposition any easier. There is no road map to block Putinism. And there are no short cuts. The fight will be a long and hard one, which the Israeli Left can win – but they cannot win it alone. 3 Comments on "The Putinisation of Israel"
Very good article, Eric. Interesting parallelism between Putin and Netanyahu. An additional critical factor for the defense of democracy which might be under threat in Israel, would be the Supreme Court. — The forces working against Netanyahu are vastly weaker than the forces working against Putin. On the one hand, a scattering of independent NGO’s and Left groups, compromised Arab governments, and a besieged Iran. On the other hand, the full might of the US and its maybe more reluctant allies. As far as I know Netanyahu’s enemies haven’t spent $5 billion dollars trying to overthrow him (as Victoria Nuland boasted). — Putin came to power at a time when Russia had been robbed by the (freedom-loving?) oligarchs. Poverty was up and life expectancy down. Boris Yeltsin gave away the store and Putin stopped it. Some say Putin rewarded his own oligarchs, but if so at least he kept the wealth in Russia. People are better off and that’s why he’s popular. I think the analogy works excellently, simply comparing the invigorated and reinvigorated Israeli right wing with potential post-2016-election events in the U. S. Netanyahu seems to have no shame when it comes to distorting reality for the benefit of himself and the ultra-orthodox religious parties that support him. In the U. S., our own continuously invigorated and reinvigorated right wing has happily moved into the realm of reality distortion (FOX news), including among their most recent ploys the return of “right to work” legislation, the increasing abandonment of public education in favor of privately run schools (which have been a disaster, but no one in government–including the president and the Democratic governor of my own state of New York–seems to care), robbing public servants’ retirement accounts and, most egregiously, gradually dismantling all pro-worker legislation that has created a healthy middle class and what had once been a happy-ish-looking compromise between labor and capital. Of course, our right wing has also tried, successfully, to prop up Netanyahu, even if it means some borderlilne illegal Congressional shenanigans, and to reinvent our president as an anti-Israel pro-Iranian puppet. Good strategy for elections, you know. And it works rather nicely around here. It is amazing, though no longer surprising, that an absurdly well-funded right wing (which loves to make friends with religious nuts as well) does so well around here and in Israel, too. Increasingly, we have billionaires elected to public office pushing the most reactionary pro-capitalist agenda that, back in the late 19th- and early-to-mid 20th century, resulted in a strong labor presence. Read USA LabourStart entries on Illinois and Michigan. And the entire old Confederacy, too. Problem is that Americans love these moneyed overlords and wait patiently for oligargical wealth to rain down upon them, too … something that will never really happen. Is Netanyahu just traveling down the same road?